It has 2 connectors. One to connect it to the brain and the other to connect a cymbal. Up to now i tried it with a Roland CY-5 but most other 2 zone cymbals should work. With the CY-5 it works quite good! Important is just that it has a piezo for the bow and a switch for the edge. It is based on the schematic of the original 2Box hihat which i posted in the other hihat thread. The only disadvantage i found up to now is the price. Making printed circuit boards in small quantities is expensive. we look forward to more pictures, videos, and a how to put this gadget in a cy-5!!! yes Manfred , thanx and congrats! Can you explain what you use to controle the open/close of the hihat ? i didnt get if it will be with the sensor device or an external pedal ? Hi Manfred... a very neat and tidy solution for sure! I think you would find that you could get these circuit boards made in batches... and we could buy in groups to assist with the cost. I know I would take at least 5 to kick off with. 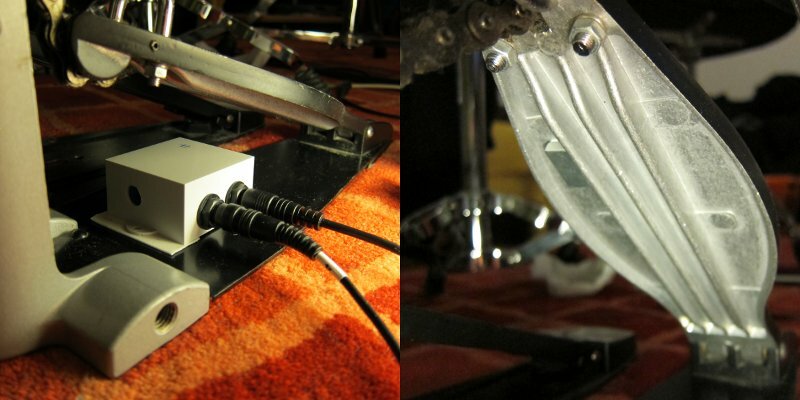 This makes the whole thing VERY easy, and of course saves people having to buy the entire hi hat just for the hall circuit, like JMan (and I) did! Are you able to give us a ballpark figure of what these might end up being worth? it is very close to the original 2Box level detection which means it uses a magnetic sensor. The tiny chip that you can see on top left of the bottom layer is the sensor. 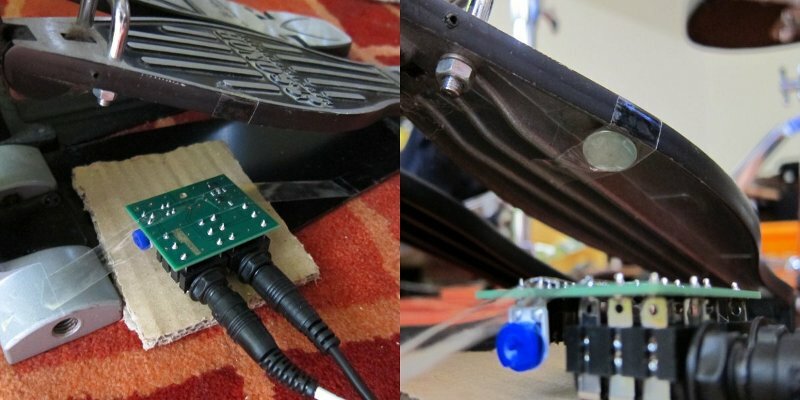 I plan to put the circuit board underneath the pedal of the hihat and stick a magnet to the pedal. Tomorrow or tuesday i can take some pictures of my test set-up. 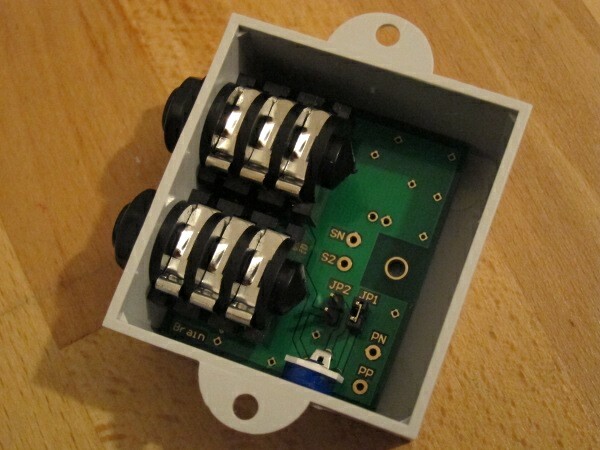 But its similar like Jman has shown with the original 2Box sensor in the thread about his stealth hihat. The reason why i started this project is that i want to have a larger hihat than 12". And to have free choice which cymbal to use i decided to separate the level detection from the cymbal. To keep the cost in a somehow reasonable range i ordered a few more circuit boards. So if someone is interested in a board for his own DIY project you can drop me a PM. But at first i want to test it more detailed. Good job Manfred, and you fit 2 jacks on the board, eliminating the need for the splitter ..... cool! J Pm Sent. for those of you who are interested in one of the boards. Please give me a few more days for testing. Up to now i tested it only for a short time with a more or less wobbly test setup. Right now i'm preparing a more steady test setup to see whether it is reliable. I want to be sure that it really works good. The level detection works quite good so far. The only difference i noticed is that foot splash sounds are not as loud as with the original hihat. I hope to have time to find out why tomorrow. My guess is that it is related to the position of the piezo at the cymbal. The 2Box cymbal has the piezo near the center while the CY-5 has it in the middle of the bow area as far as i know. Edit: By the way, all the tests were done with OS1.10 up to now. some small progress today again. The reason why foot splashes have had a lower volume is simply that zone 3 does not trigger as much as with the original cymbal. With the original hihat i have almost always zone 9 and 3 triggered when stepping on the pedal. With the CY-5 the zone 3 triggers have been much lower or haven't even been there. But all these things can be adjusted by playing with gain and volume parameters in the module and the poti on the board. Besides the CY-5 i also tried two other cymbals today. The first was a regular 14" 2Box cymbal (actually my ride cymbal). It works also but is too heavy for the hihat stand. The second one was a cheap single zone Millenium MPS-200. That works also but with only one zone of course (no differentiation between bow and edge). Regarding the "playing feeling" both are not acceptable as a hihat but i just wanted to see if it works with other cymbals. Next step is to update the OS and see what the new hihat parameters on page HPED can be used for. The description sounds interesting. Looking forward to these Manfred! Can you explain what the jumper switches are for?